Renault has added two electric vehicle specialists to its fleet team to provide expert guidance for fleets looking to switch to EVs. The appointments form part of Renault’s recent fleet team restructure and will see Mathew Kiziuk and Jonny Berry based regionally to cover the entire country, supporting the regional leasing team with electric vehicles sales to current and potential customers. 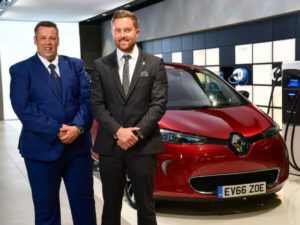 Kiziuk joins from the Renault dealer network where he was brand manager while Berry previously worked within the Nissan dealer network where he was recently awarded the Global CEO Award and named Best Overall EV Dealer for Electric vehicle performance in the UK. Berry commented: “Many people can be initially sceptical about electric vehicles, particularly business. In the last three years the challenge of explaining the benefits of electric vehicles has been a great experience. The chance to expand this to business customers and learn a new brand is really exciting.”For more of the latest industry news, click here.